It is designed for non-messy application and convenience in use when applying powder on the baby body. PACK SIZE: 1 Powder case in a box. FEATURES: Daily care for the baby is vitally important. When there are safe and handy products to help, the hard work is transformed into the joy of bonding with the baby. The products of this range are a part of the preparations for childbirth and can be used throughout the child’s transition from newborn to toddler. 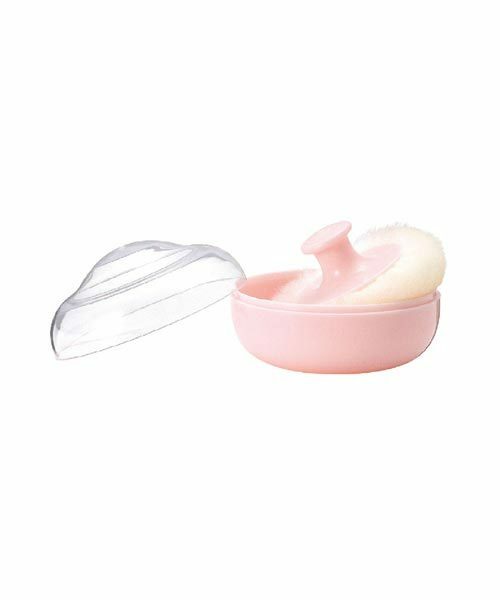 It is designed for non-messy application and convenience in use when applying powder on baby body. The hair of the puff is short and fine for easy and non-messy application of powder onto the baby. Also Available in yellow colour. INGREDIENT: Pigeon powder case contains natural plant extracts of Olive oil It is known for its emollient properties, hence good moisturizer and easily absorbed by the skin adding shine to the baby’s skin. Rosehip: Rosehip is enriched with Vitamins A, C, E and Beta Carotene and it has good anti-inflammatory properties also that help to relieve skin irritation. It provides excellent moisturization to the skin when it is easily absorbed. with a Refreshing fragrance of Lilac & Vanilla.